WNBA draftees on draft night. Photo courtesy of WNBA. The prevailing sentiment among fans and media members seems to be that 2018 is the most competitive season in WNBA history. Some previously-dominant teams are struggling, or barely eking out wins, while others have engineered meteoric trips to the top. Parity is at an all-time high, and for most of the season, the majority of teams were separated in standings by one game or less. With the league’s 2016 transition to the top eight teams making it to the postseason, regardless of conference, every game is critically important as we close out the regular season. Rookies always have the potential to be game-changers, but there seems to be something special about this year’s rookie class. Many new draftees quickly fit in like old pros (e.g., A’ja Wilson, Diamond DeShields, Ariel Atkins). A few are being mentored by some of the best (e.g., Jordin Canada, by Sue Bird). 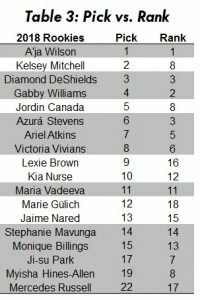 Others served key roles on their teams (e.g., Gabby Williams, Kelsey Mitchell, Victoria Vivians, Monique Billings). The remainder have great potential. Overall, this class is pretty solid; hence, we were curious as to how well they stack up. In this study, we evaluated the per game stats of the 2018 rookie class to compare their overall game against each other and to players who entered the league since 2013 (year of the infamous, “Three to See”). Player rankings were done in line with the procedure demonstrated in the “Top 20 at 20” piece we published in 2016 with turnovers and fouls included to more broadly capture player impact. Per-game statistics for each player were ranked based upon her peers and each athlete’s overall ranking was computed by taking a mean of their ranking for each statistic (points (PPG), Rebound (RPG), assists (APG), steals (SPG), blocks (BPG), turnovers (TPG) and fouls (FPG). 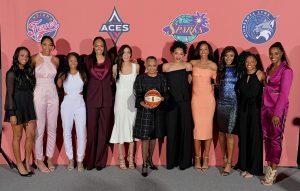 Statistics were collected from wnba.com and cover all games played from the 2013 season up to July 31, 2018. As with each class, 36 players were drafted into the league this year. Only half of them remain, and guards make up a third of the new players. The league’s two new combo players are Dallas’ Azura Stevens and Las Vegas’ Jamie Nared. Table 1 provides a snapshot of player statistics with color coding to help visualize per game impact. While arguable in select cases, generally speaking, more points, rebounds, steals, blocks and minutes have a positive impact on team success. Hence, the color scale transitions from low (red) to high (green) for each statistical category. Conversely, high turnovers and fouls typically result in a negative effect; accordingly, the color scale for these two stats range from low (green) to high (red). Super rookie Wilson leads her cohort in points, blocks, rebounds and minutes per game. Williams is the steals leader and Canada dishes the most assists. 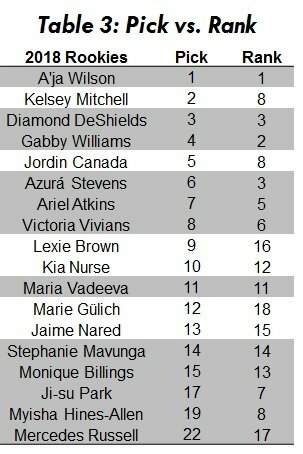 Wilson, DeShields and Stevens are top five in both scoring and rebounding with Mitchell and Atkins, and Williams and Aces forward Ji-Su Park round out of the list of high performing scorers and rebounders, respectively (Table 2). Based on overall ranking, the top five rookies are Wilson, Williams, DeShields, Stevens and Atkins. 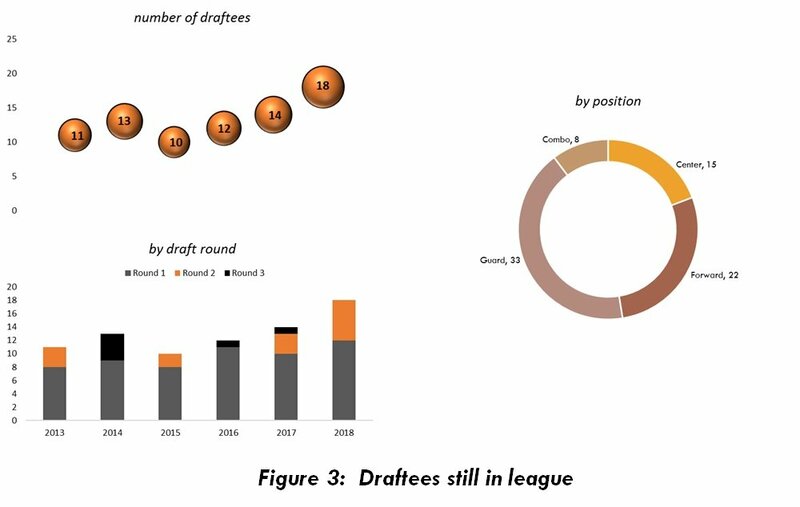 Multiple teams drafted two or more players, reflecting a decided focus on building for the future. 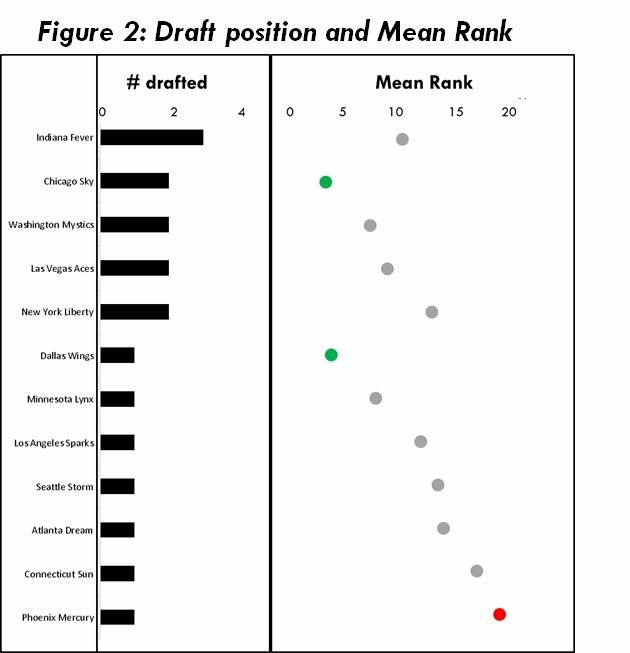 With an average rookie rank of 2.5 and 3, the Chicago Sky (DeShields and Williams) and the Dallas Wings (Azura Stevens) have netted the best return on their draft selections (Figure 2). Since many have deemed this rookie class as one of the most talented from top to bottom, the next question is: have they indeed lived up to the hype? 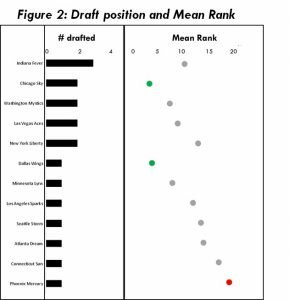 We started with simply comparing when each player was drafted as a proxy for perceived rank entering the league to our statistics-based ranking. Table 3 highlights the players whose overall rank matches or exceeds the order they were picked. Note that many seem to have fulfilled or exceeded expectations, thus far. Although players like Mitchell and Canada appear to be performing below their perceived value entering the draft, they are still ranked in the top 10 overall amongst rookies. Many other newcomers have begun to catch fire as the regular season has wound down. This class has great potential! Taking a longer-term view of how these players compare to classes before them, I compiled statistics of players who entered the league from 2013 to present. Why 2013? 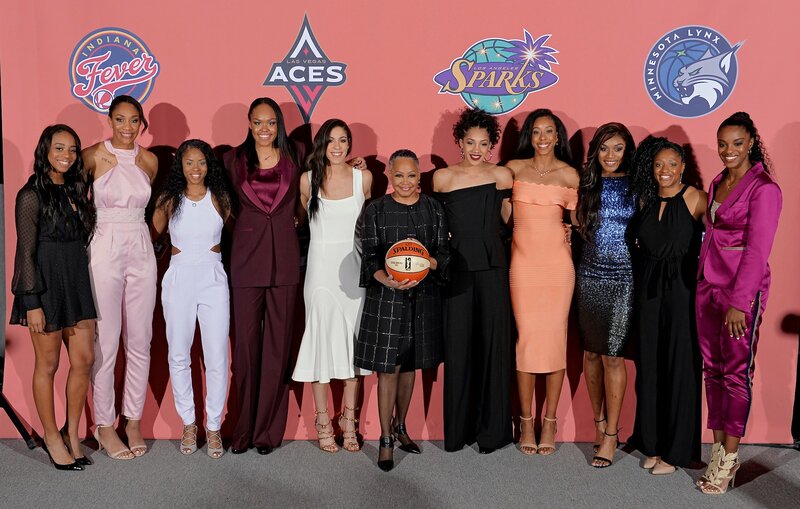 It was the year that highly-touted draftees Britney Griner, Elena Delle Donne and Skylar Diggins-Smith were deemed “The three to see.” Their mere presence got the league a lot of attention, and their play has since delivered their promise, and then some. 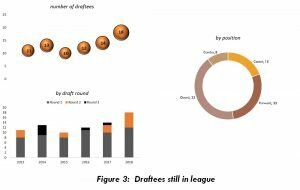 Thirty-six percent (78 of 216) of the players drafted since 2013 remain in the league. Unsurprisingly, most players making WNBA rosters were drafted in the first two rounds. Figure 4 displays box plots of the players’ stats (with outliers) for each year. Generally speaking, outliers represent points beyond the general distribution of a data set and if we were doing predictive statistics, they may be candidates for removal. In this case, I used these outliers as a means of identifying the athletes whose play is above the rest. On multiple occasions, both 2016 No. 1 pick Breanna Stewart and this year’s top draftee, Wilson, are identified as “outliers” in their class. Upon ranking all the players by per game performance, I found that the top 10 draftees from 2013-2018 consist of at least one player for each class (Table 4). With two players from the 2013-2015 and 2018 classes, this year’s great rookie class is in great company. The big question is whether the 2018 draftees can maintain this level of play. So many things go into being a great basketball player. The recent ACL injuries to Angel McCoughtry and Sancho Lyttle remind us of the importance of conditioning and rest. Here’s to hoping that this new class stays healthy, committed, and continues to help push the league forward. Sidebar: Transition to Position-less basketball? While we’re here, I thought I’d take a quick detour to add to the discussion on position-less basketball. With emphasis on the hybrid player who can transition smoothly between guard and post duties, there is an ongoing debate in both men’s and women’s basketball as to whether the game is trending away from defined player roles. On the women’s side, retired greats Tina Thompson and Lauren Jackson are key players who come to mind when we talk about multi-faceted players. Some may see them simply as bigs with inside-outside game, but they were pioneers of a particular style of play. They could bang around inside the paint, but still get buckets from anywhere on the floor. Active players Tina Charles, Tianna Hawkins, Theresa Plaisance, Stefanie Dolson and Amanda Zahui B. are very much in the Thompson-Jackson mold. Tamika Catchings and Sheryl Swoopes were the best two-way players the league has had, as they were terrors on both sides of the court. Eleven-year veteran Candace Parker, in the meantime, has taken the concept of being multi-faceted to another level. She consistently demonstrates that she is the greatest stat stuffer of all time (ranked the No. 1 all-around player in our “Top 20 at 20”). At present, she is ranked the top 10 in scoring, rebounds and assists and regularly threatens to drop triple-doubles. While we laud the beautiful game that Delle Donne, Stewart, Stevens and play, Parker undeniably serves as the female prototype of position-less basketball. Whether this style of play becomes more of the standard is yet to be seen. 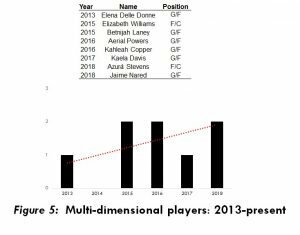 Given that players are constantly expanding their game, the eye test says multi-dimensional players are on the rise. 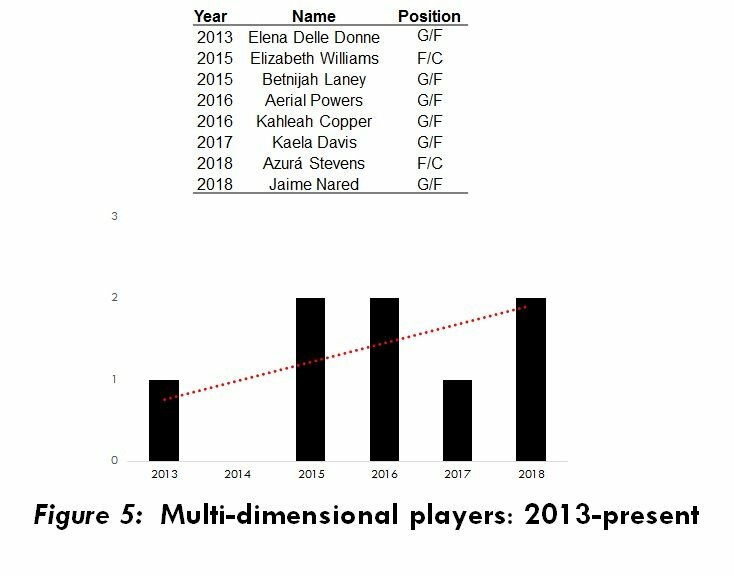 An assessment based on the WNBA’s position classifications shows that only 8-10 percent of those drafted since 2013 are designated as multidimensional players with, at most, two per year, including none in 2014 (Figure 5). But there are actually more of these players than are officially listed. The league may want to reconsider position classifications to provide a more accurate description of what players bring to the court. Until then, whether the slight increase in the number of hybrid players signifies the beginning of a transition will apparent fairly soon, so stay tuned. Disclaimer: Without question, there are other ways we could have evaluated and compared the players. There are pros and cons to any approach employed and advanced statistics are always fun, but some find them a bit obscure. Hence, I wanted use simple statistics to explore patterns and provide a general assessment of the performance and potential of the league’s new crop of talent.